The Schuyler County Stream Program was developed through the cooperative efforts of the Schuyler County Legislature, the Schuyler County Soil and Water Conservation District and various local municipalities within the County. The program was initiated in response to severe storms and flooding in the mid-nineties that created a crisis for many of the county’s landowners. The purpose of the stream program is to provide cost share funds and technical assistance for stream restoration and streambank protection projects with the ultimate goal of protecting water quality and reducing future losses of public and private property from streambank erosion and flooding. We work on a shared services basis with our Villages, Town and County to implement stream stabilization to protect our millions of dollars in failing infrastructure and at the same time reduce the amount of sediment and nutrients entering our waterbodies. We have an operator from May-October to run our equipment as well as Chemung County Soil and Water, Town, Village, and County Equipment to assist with this program. Over $1.3 million dollars in projects are done annually and we utilize a combination of practices from rock weirs, rock veins, j-hooks, stacked rock walls, sloped rock walls, root wads, riparian buffer establishment etc... We have a General Permit with NYS DEC and Regional Permit with Army Corp.
A fish passage project was completed on Williamee Road in the Town of Hector. This was a joint project with the National Forest Service, the Town of Hector, and the Soil and Water Conservation District. This project is one of two that will be completed in the town. Next year funding has been obtained to do the second project with funding from the National Forest, Trout Unlimited, and NYS DEC.
through the Environmental Protection Fund to cost share this project. 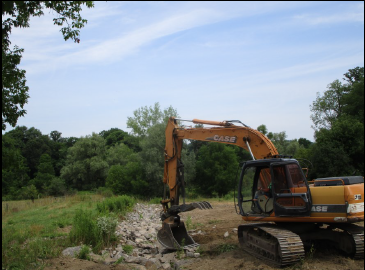 Schuyler County Soil and Water Conservation District partnered with Chemung County Soil and Water Conservation District to construct 1,500’ of stream stabilization on Mike Folts Vineyard in the Town of Jerusalem. This project was part of a joint effort with Yates County Soil and Water Conservation District. Yates County obtained funding to assist with the cost share of this project. obtained funding to assist with the cost share of this project. The Soil and Water Conservation District was able to work with the Town of Catharine, and Town of Hector Highway Departments to stabilize nearly 2,000’ of stream. This area has greatly incised over the course of many years, causing significant bank erosion, that threatened many homes, and New York State 228. This project utilized a combination of rip rap, and willow cuttings to form over 23 instream structures. We were able to obtain funding thanks to Senator Omara, through the Environmental Protection Fund to replace to culverts on Decker Road in the Town of Cayuta with a large concrete box culvert. This project replaced to 7’ culverts down stream of two 9’ culverts that also has Banfield Creek (a significant tributary) increasing flow above the replaced pipes. Jackson Creek is a trout stream that is a direct tributary to Cayuta Creek. These twin pipes posed a significant flooding risk for county road 13 and created a barrier for fish passage. This project was a significant joint effort. This project couldn't have been done without many individuals, but especially Jim Barrettt, Tom Beach, Brian Sidle, and Todd Jansen. This project was a joint effort from Schuyler and Chemung County Soil and Water Conservation Districts, the Town’s of Cayuta, Horseheads, Newfield, VanEtten, and Montour Highway Departments, as well as Schuyler County Highway Department. This made for an efficient project allowing the work to be completed in just a weeks time. The Soil and Water Conservation District was able to stabilize a bridge that was washed out during flooding events of 2015. This bridge provides the only access to the conservation club property. A stabilization project was done on an eroded tributary to Seneca Lake. Rock riffles were installed to stabilize the area. A stabilization project was completed jointly with the Soil and Water Conservation District and the Town of Hector on Hector Falls Creek. Over 1,000’ of stream was stabilized. 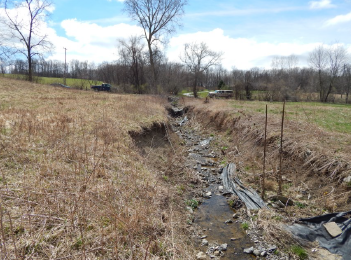 A joint effort with the Town of Dix Highway Department and the Soil and Water Conservation District allowed for over 500’ of stream to be stabilized on the Labarr farmstead. The Soil and Water Conservation District installed an improved crossing area for a farm on behalf of the New York State Department of Environmental Conservation. The project is directly adjacent to Catharine Creek. 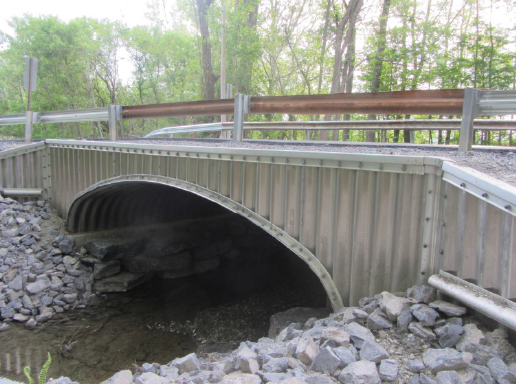 The Schuyler County Soil and Water Conservation District installed an engineered rock riffle downstream of the Lamoka Lake Road bridge. The outlet side of the bridge has been incising causing the footers of the bridge to become exposed with the head cut. Check out more projects below!